Mytilus galloprovincialis (blue mussel or the Mediterranean mussel) is native to the Mediterranean coast and the Black and Adriatic Seas. It has succeeded in establishing itself at widely distributed points around the globe, with nearly all introductions occurring in temperate regions and at localities where there are large shipping ports (Branch and Stephanni 2004). Ship hull fouling and transport of ballast water have been implicated in its spread and its impact on native communities and native mussels has been suggested by a number of studies and observations (Carlton 1992; Robinson and Griffiths 2002; Geller 1999). Mytilus galloprovincialis is dark blue or brown to almost black. The two shells are equal and nearly quadrangular. The outside is black-violet coloured; on one side the rim of the shell ends with a pointed and slightly bent umbo while the other side is rounded, although shell shape varies by region. It also tends to grow larger than its cousins, up to 15cm, although typically only 5-8cm. Adult mussels spawn gametes, after which fertilization of an egg occurs. The egg undergoes gametogenesis, forming a larvae. The larva forms into a juvenile which settles and attaches itself using byssal threads after 2 to 4 weeks (Matson 2000). Mytilus galloprovincialis is widely cultivated in Japan and China (Morton 1996). In its native range, M. galloprovincialis can be found from exposed rocky outer coasts to sandy bottoms (Ceccherelli and Rossi 1984). As an invader it typically requires rocky coastlines with a high rate of water flow. 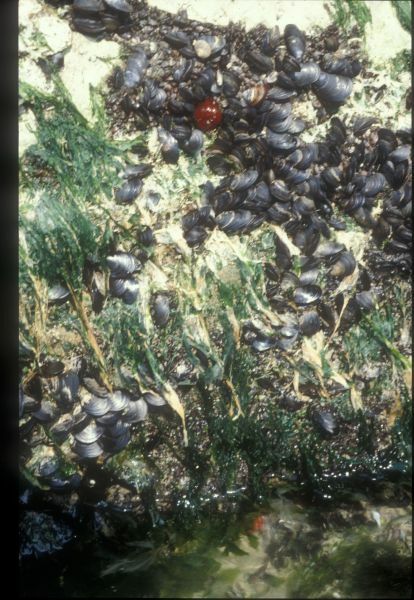 In fact, unlike the other 26 Asian and Atlantic molluscs introduced into Pacific regions only one introduced species, the Mediterranean mussel M. galloprovincialis, occurs in open coast, high energy environments on the Pacific coast; all remaining species are restricted to bays and estuaries (Carlton 1992). Gonochoristic reproduction where males and females spawn simultaneously. M. galloprovincialis also has high fecundity and spawns at the time of year with the highest water temperature (Bayne 1976). A filter-feeding bivalve that eats a wide range of planktotrophic organisms. This species prefers fast moving water that is free of sediment and thrives in regions where nutrient-rich upwelling occurs. Principal source: Branch, G.M. and Steffani, C.N. 2004. Can we predict the effects of alien species? A case-history of the invasion of South Africa by Mytilus galloprovincialis (Lamarck). Journal of Experimental Marine Biology and Ecology. 300:189-215. Recommended citation: Global Invasive Species Database (2019) Species profile: Mytilus galloprovincialis. Downloaded from http://www.iucngisd.org/gisd/species.php?sc=102 on 22-04-2019. The alteration of benthic community dynamics by introduced bivalves on the Pacific coast remains largely uninvestigated including the impact of such invasives as M. galloprovincialis, but also Geukensia demissa, Musculista senhousia, Mya arenaria, Crassostrea virginica, Venerupis philippinarum, and Gemma gemma. 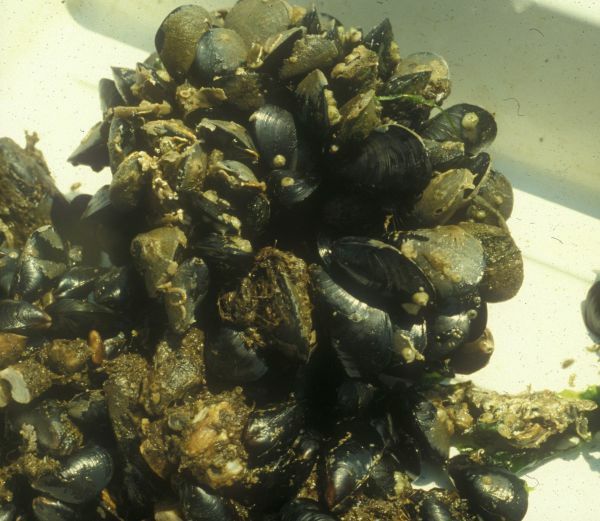 It is known that M. galloprovincialis is able to outcompete and displace native mussels and become the dominant mussel species in certain localities. This is because M. galloprovincialis may grow faster than native mussels, be more tolerant to air exposure and have a reproductive output of between 20% and 200% greater than that of indigenous species (Van Erkom Schurink and Griffiths 1993, in Branch and Stephanni 2004). In a experiment to test the tolerance of the three native South African species to aerial exposure (in comparison to M. galloprovincialis) mussels were held for 42 weeks at the high-tide level where they experienced up to 7 days of continuous exposure to air. Under these conditions, survivorship of M. galloprovincialis was 92%, but 78% for Perna perna, 37–46% for Choromytilus meridionalis and 0–10% for Aulacomya ater (Hockey and van Erkom Schurink 1992, in Branch and Stephanni 2004). In South Africa the indigenous ribbed mussel A. ater was progressively displaced from semiexposed and exposed shores as the cover of M. galloprovincialis rose there. At sites where M. galloprovincialis was experimentally removed, there were no declines of A. ater (G.M. Branch Unpub. Data, in Branch and Stephanni 2004). Similarly, in southern California the introduction of M. galloprovincialis has been associated with a decline in the closely related native mussel M. trossulus (Geller 1999). Since the 1980s the introduced Mediterranean mussel (M. galloprovincialis) has successfully invaded the southern African coastline and has become the dominant species on rocky intertidal shores of the west coast. A comparative study by Robinson and Griffiths (2002) to investigate differences between M. galloprovincialis invaded areas and non-invaded areas was conducted in Langebaan Lagoon, South Africa, and highlighted the affect M. galloprovincialis has on naturally-occurring communities. Communities in invaded areas differed significantly from non-invaded areas with figures indicating that naturally-occurring sandbank communities were being replaced with communities more typical of rocky shores. To conserve the natural biota of the centre banks, which lie within a national park, the mussel beds should to be removed (Robinson and Griffiths 2002). Ballast water management could stop the spread of its larvae. A new technique used in the aquaculture industry is the production of triploid and tetraploid mussels, which are functionally sterile, thereby eliminating the risk of wild populations establishing (McEnnulty et al. 2001). Informations on Mytilus galloprovincialis has been recorded for the following locations. Click on the name for additional informations. Griffiths, Charles and Jennifer, Day. 2004. Aquatic invasive species in South Africa- Environmental impacts and management responses. In Abstracts: 13th International Conference on Aquatic Invasive Species, September 20-24, 2004. Lynch West County Hotel, Ennis, County Clare, Ireland. Summary: Report into presence and location of aquatic invasive species and management plans used for control in South Africa. Jenner, Henk A. and Janssen-Mommen Jake 2004. Exotic cooling water fouling organisms in the Netherlands with emphasis on heat treatment of the Japanese oyster Crassostera gigas. In Abstracts: 13th International Conference on Aquatic Invasive Species, September 20-24, 2004. Lynch West County Hotel, Ennis, County Clare, Ireland. Summary: Report on the effectiveness of heat treatment on Crassostera gigas in the Netherlands. McEnnulty, F.R., Bax, N.J., Schaffelke, B. and Campbell, M.L. 2001. A review of rapid response options for the control of ABWMAC listed introduced marine pest species and related taxa in Australian waters. Centre for research on introduced marine pests, Technical Report 23. June 2001. CSIRO Marine Research. Summary: Outlines management techniques and response options to invasions by marine organisms in Australian waters. Anderson, A.S., Bilodeau, A.L., Gilg, M.R., and Hilbish, T.J. 2002. Routes of introduction of the Mediterranean mussel (Mytilus galloprovincialis) to Puget Sound and Hood Canal. Journal of Shellfish Research. 21 (1): 75-79. Summary: Reports on alternate routes of introduction in Puget Sound as well as where the Mediterranean mussel has so far established. Apte, S., Holland, B.S., Godwin, L.S., Gardner, J.P. 2000. Jumping ships: a stepping stone event mediating transfer of a non-indigenous species via a potentially unsuitable environment. Biological Invasions. 2: 75-79. Summary: A good article that deals with ballast water organisms from one ship being passed onto another and further transported to other areas. Bayne, B.L. 1976. Marine mussels: their ecology and physiology. Cambridge University Press: New York. Summary: Book on ecology, development, life cycles, and physiology of all marine mussels. Bishop Museum. 2002. Records of the Hawaii Biological Survey for 2000. Bishop Museum Occasional Papers: No. 68. Summary: Gives details of the Hawaii Biological Survey for 2000, which included an incidence of M. galloprovincialis. Summary: Investigation into how the environment dictates the success or failure of a Mytilus invasion. Branch, G.M. and Steffani, C.N. 2004. Can we predict the effects of alien species? A case-history of the invasion of South Africa by Mytilus galloprovincialis (Lamarck). Journal of Experimental Marine Biology and Ecology. 300: 189-215. Summary: This article gives a great case history of the invasion in South Africa. Caceres-Martinez, J. and Figueras, A. 1998. Distribution and abundance of mussel (Mytilus galloprovincialis Lmk) larvae and post-larvae in the Ria de Vigo (NW Spain). Journal of Experimental Marine Biology and Ecology. 229: 277-287. Summary: This article compares samples of larvae from offshore and nearshore along Spain. Carlton, J.T. 1992. Introduced marine and estuarine mollusks of North America: an end-of-the-20th-century perspective. Journal of Shellfish Research. 11 (2): 489-505. Summary: A summary of the invasive species in the North American marine environment. Carlton, J.T. 1992. Introduced Marine and Esturine Mollusks of North America: An End-of-the-20th-century Perspective, Journal of Shellfish Research 11(2): 489-505. Carlton, J.T. 2003. Community assembly and historical biogeography in the North Atlantic Ocean: the potential role of human-mediated dispersal vectors. Hydrobiologia. 503: 1-8. Summary: This article discusses the historical and current occurrence of biological invasions in the North Atlantic Ocean, and outlines possible means of human-assisted dispersal. Ceccherelli, V.U. and Rossi, R. 1984. Settlement, growth and production of the mussel Mytilus galloprovincialis. Marine Ecology Progress Series. 16: 173-184. Frolenko, L.N. and Studenikina, E.I. 2002. Bioecological characteristics of benthic species - inhabitants of the Sea of Azov, Izvestiya Vysshikh Uchebnykh Zavedenii Severo-Kavkazskii Region Estestvennye Nauki 4: 81-86. Geller, J.B. 1999. Decline of a native mussel masked by sibling species invasion. Conservation Biology. 13 (3): 661-664. Summary: This article discusses the decline of native mussel species in North America, and the possible association with the introduction of M. galloprovincialis to North American waters. Godwin, L.S. 2003. Hull fouling of maritime vessels as a pathway for marine species invasions to the Hawaiian islands. Biofouling. 19: Supplement 1. 123-131. Summary: This paper outlines the introduction of invasive species to the marine environment in Hawaii by means of ship fouling. Summary: Discussion into the effects and impacts of alien marine invertebrates in South Africa. Hammond, W. and Griffiths, C.L. 2004. Influence of wave exposure on South African mussel beds and their associated infaunal communities. Marine Biology. 144: 547-552. Summary: This study examined the infaunal communities associated with mussel beds in South Africa. Hanekom, N. and Nel, P. 2002. Invasion of sandflats in Langebaan Lagoon, South Africa, by the alien mussel Mytilus galloprovincialis: Size, composition and decline of the populations, African Zoology 37(2): 197-208. Hockey, P.A. and van Erkom Schurink, C. 1992. The invasive biology of the mussel Mytilus galloprovincialis on the Southern African coast. Transactions of the Royal Society of South Africa. 48 (1):123-139. Summary: This article provides a case study of the invasion into South Africa and the rate of spread. Matson, S.E. 2000. Hybridization of the mussels Mytilus trossulus and Mytilus galloprovincialis: larval growth, survival and early development. Masters Thesis - University of Washington. Summary: This thesis gives details about the introduction of Mytilus galloprovincialis and its hybridization with M. trossulus. McDonald, J.H., Koehn, R.H., Balakirev, E.S., Manchenco, G.P., Pudovkin, A.I., Sergiyevskii, S.O. and Krutovskii, K.V. 1990. Species identity of the common mussel inhabiting the Asiatic coasts of the Pacific Ocean. Biologi�i�a Mor�i�a. 1: 13-22. Summary: This gives details of the presence of M. galloprovincialis in Korea. McDonald, J.H., Seed, R. and Koehn, R.H. 1991. Allozyme and morphometric characters of three species of Mytilus in the Northern and Southern Hemispheres. Marine Biology. 111: 323-335. Summary: This paper gives a global perspective of Mytilus in different regions of both its native and introduced range. Summary: A summary of aquatic invasive species worldwide, with examples and definitions. New South Wales (NSW) Department of Primary Industries, Fisheries., 2006. Aquaculture prospects for the Blue Mussel. Summary: This photographic guide covers a selection of the larger animals which live round the coasts of Britain and Ireland. It is intended for divers and marine biologists who need to be able to recognise species in situ and is not an exhaustive identification guide. Ramirez, S.C. and Caceros-Martinez, J. 1999. Settlement of the blue mussel Mytilus galloprovincialis Lamark on artificial substrates in Bahia de Todos Santos, BC, Mexico. Journal of Shellfish Research. 18: 33-39. Summary: This article deals with M. galloprovincialis settlement on artificial structures in Mexican waters. Robinson, T.B. and Griffiths, C.L. 2002. Invasion of Langebaan Lagoon, South Africa, by Mytilus galloprovincialis: Effects on natural communities, African Zoology 37(2): 151-158. Sebastian, C.R., Steffani, C.N. and Branch, G.M. 2002. Homing and movement patterns of a South African limpet Scutellastra argenvillei in an area invaded by an alien mussel Mytilus galloprovincialis, Marine Ecology-Progress Series 243: 111-122. Vario, S.L., Koehn, R.K. and Vainola, R. 1988. Evolutionary genetics of the Mytilus edulis complex in the North Atlantic region. Marine Biology. 98: 51-60. Summary: This article discusses the relationships between Mytilus spp. It also discusses hybridization of native and non-native species. Wilkins, N.P., Fujino, K., and Gosling, E.M. 1983. The Mediterranean mussel Mytilus galloprovincialis Lmk. in Japan. Biological Journal of the Linnean Society. 20:365-374. Summary: This article gives an in depth look into the introduction of M. galloprovincialis in Japan. Summary: Investigation into the factors limiting the success of an invasion at two sites in Washington by Mytilus galloprovincialis.